The HP G72-C55DX is one of the best bang-for-the-buck laptops you can buy. The HP G72-C55DX sports a huge 17.3" LED (1600 x 900) backlit display and the latest Intel Pentium P6100 processor. You don't break the bank with this laptop since the HP G72-C55DX is available on sale at Best Buy for $449.99! My family and I were looking for a laptop to purchase for my mother-in-law as a gift for Christmas and this laptop certainly fit the bill. We wanted to get her a large screen since she is older and smaller screens strain her eyes. But most 17" screen laptops I came across were $700 or more. I headed to Best Buy in Norwalk, but I literally just missed the last one being sold, with a woman exchanging another laptop for this model. I then had to drive 35 minutes to Hartsdale, New York to another Best Buy location to pick one up. But it was well worth it! Many competing laptops, especially with AMD processors only sport 2 levels of cache. Also, this Intel chip has an integrated on-chip graphics processor (GPU), whereas its counterpart the Athlon II dual-core does not. This means that a laptop using the AMD chip will need a discrete graphics card, which will draw additional power. The Intel Pentium P6100 processor scored better than AMD Athlon II P340 in top benchmark rankings. 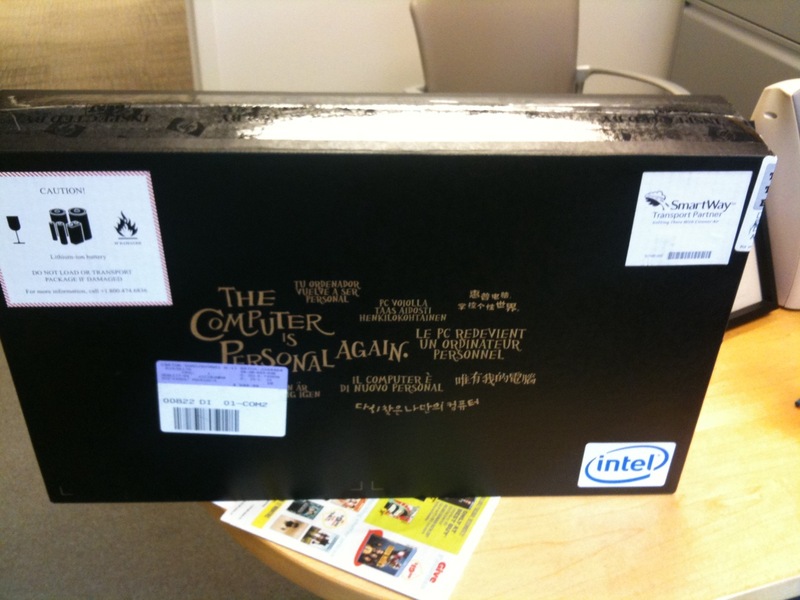 So tempted to rip open the box and play with this bad boy a little! My mother-in-law is just going to have my configure it anyway, so might as well have it all setup so it's ready for use on Christmas, right? The Intel Pentium P6100 processor is connected to the integrated Intel HD graphics via QPI (quick path interlink), so it improves speed dramatically and cuts down on power usage. The integrated HD graphics can decode AVC/H.264, MPEG-2 and VC-1 and supports Blu-Ray with hardware acceleration. Up to 1696MB memory is allocated to graphics. Don't expect good 3D gaming performance though with this video card. But my mother-in-law doesn't play video games any way. The HP G72-C55DX laptop comes with 4GB memory, which is more than enough, but can be upgraded memory up to 8GB memory. The hard drive is 500GB and 5400RPM and not 7200RPM like I would prefer, but the performance loss is negligible as long as she doesn't start paging to disk. 5-in-1 digital media reader that supports Secure Digital, MultiMediaCard, Memory Stick, Memory Stick PRO and xD-Picture Card formats. It sports Windows Home Premium 7 64-bit, which is good. Ultimate would be better, but she doesn't really need that. The battery pack integrated in HP G72-C55DX offers up to 5 hours of battery life. Amazingly, even with the large screen, the machine weighs only 6.6lbs and is amazingly thin too - only 1.47" at its thickest. At $449.99 you won't find many laptops less expensive than the HP G72-C55DX especially with such a large screen. I've seen smaller 10.1" netbooks with slower Atom processors that cost more than this laptop! Definitely a good buy. Might have to go back and buy one for myself! HP has unveiled a big-size but sleek laptop model known as HP G72-C55DX that integrated with 17.3” LED backlit Display and latest Intel Pentium P6100 processor. You don’t have to drill your pocket to grab this big laptop, as HP g72-c55dx tagged with $450 approx at the time of writing. The main advantage of the laptop is you can watch video in bigger display and with good resolution. Here are specs of G72-C55DX model. Processor- HP G72-C55DX laptop powered by Intel Pentium P6100 processor that provides a decent performance. It clocked with 2.2GHz frequency and has 3 MB smart cache, shared dynamically by each core. The processor scores more than AMD Athlon II P340 and Turion II P540 in top benchmark rankings. Second of all, Intel Pentium P6100 processor comes with Intel Integrated HD graphics that connected to the processor via point-to-point interconnect known as QPI link; its like a hyper Transport link of AMD processor. Again, the processor is connected with memory via Integrated memory controller. Thus, the need of FSB bus is removed and performance of the processor increases as well, compare to the old structure. HDD- It comes with 500GB SATA drive which works with speed of 5,400 rpm and Windows 7 Home Premium operating system is installed on it. Display: The display of the laptop measures 17.3”. It features LED backlit LCD display that comes with 1600*900 resolutions. 3 USB 2.0 port to connect other USB compatible devices and share data. 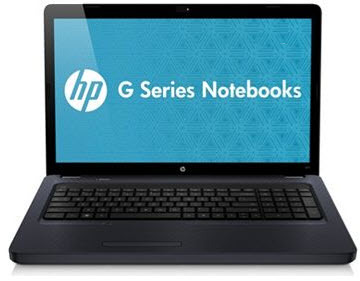 At $450 HP g72- c55dx is inexpensive laptop if you compare its feature with other similar options available in market. For an example Acer Aspire AS7714Z-4643 which has almost similar feature and it’s hard drive provides 250GB less disk space than HP’s G72- C55DX. But it cost you $50 extra.